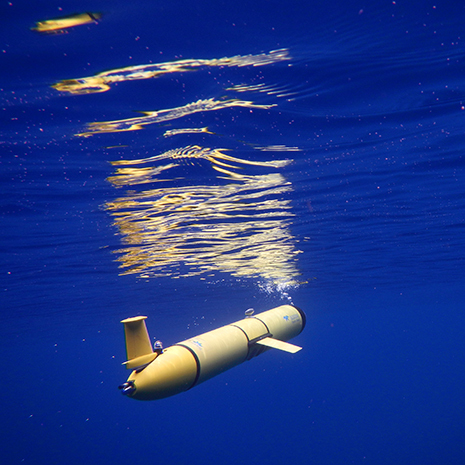 The Slocum Autonomous Underwater Vehicle (AUV), built by Teledyne Webb Research Corporation (Falmouth, MA), is an integrated instrument platform designed to operate in the coastal oceans up to 1000m depth. It has no propeller. It is designed such that, by adjusting its volume via a ballast engine, it dives and climbs in a sawtooth pattern. The result is a low cost, highly adaptable autonomous underwater vehicle with a very low power requirement. While traversing the sawtooth or ‘gliding’, the vehicle slowly travels horizontally at about 1 kph. Whilst gliding, a fin steers the glider towards continuously adjustable waypoints. The glider communicates via an Iridium satellite link when at the surface, allowing frequent contact to operators anywhere in the world. This continuous link allows pilots to change flight plans and for scientists to acquire data from the gliders several times per day. This live data is integral to understanding the ocean in real-time.